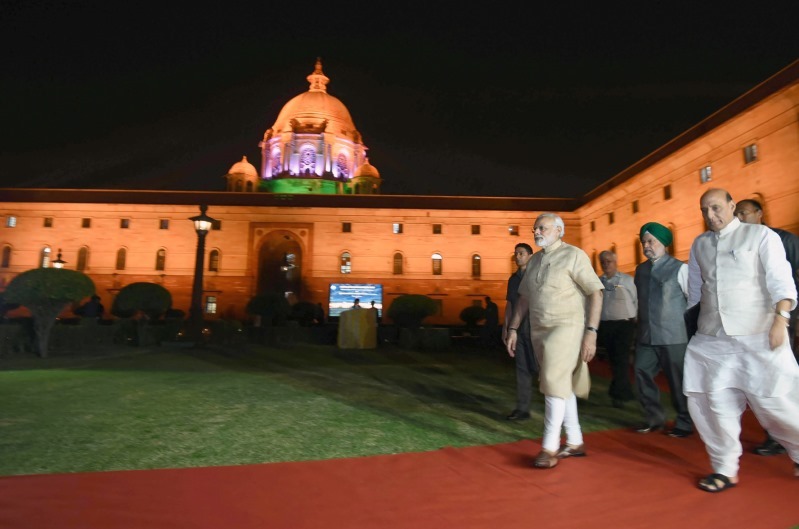 The Prime Minister Shri Narendra Modi witnessing the new dynamic facade lighting of North and South Blocks that offers an enhanced visual treat . The Union Home Minister, Shri Rajnath Singh and the Minister of State for Housing and Urban Affairs, Shri Hardeep Singh Puri are also seen. The famous Central Vista of the National Capital just got dynamic! The present famed special lighting has moved from being static to dynamic, offering an enhanced aesthetic experience. The new dynamic façade lighting, over an area of 21,450 sq. m has the potential to present an amazing 16 million colour combinations, displaying a wide range of patterns and themes during the night time with colours changing every few seconds. The entire network of new dynamic lighting using the state of the art RGB LED technology with 40 kms of unified power and data cabling has central computerized control with automated selection of colour combinations, with selection of timing, dimming and switching on and off facility, individual and combined control of light fittings etc through Ethernet based controller. The annual saving on account of new lighting of 21,450 sq.mtres of façade area in respect of replacement, maintenance and operation cost will be Rs.86.40 lakhs. The life of the new LED light fittings is over one lakh burning hours, coming to about 25 years as against only 10,000 burning hours for the existing. Energy consumption by the present limited conventional lighting using LED, Metal Halide and Sodium Vapour light fittings is Rs.17.00 lakhs per year, double that of the extended year round new dynamic lighting with an energy consumption of only Rs.8.40 lakhs per year.